At the time it seemed that Paris had yet again become the center of a world revolution, but in time a quite diffferent legacy has emerged, recalls Diana Johnstone fifty years later. 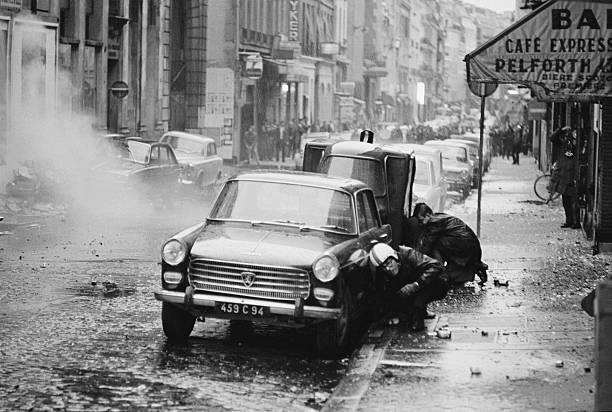 Two men protect themselves by crouching behind cars during civil unrest in Paris, 30th May 1968. (Getty free embed). Tags: Charles de Gaulle Communist Party Daniel Cohn-Bendit Diana Johnstone Edgar Morin France Martin Luther King Jr. The relevance of Cultural History has been obliterated by the powerful force of Facebook, Instagram and Twitter. History and histories have been expunged by the Power of the Here and Now. The Now-Century political revolution, this ‘new american century’ conquest of the proletarian class, led by Donald Trump, is a turn back to the age of poor houses and the indigent Labor Force of long begone centuries. 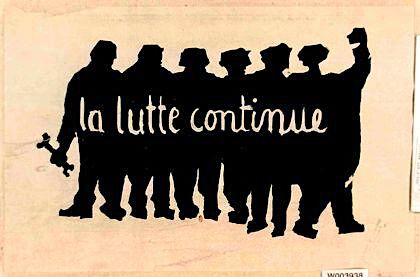 The Brave New World is upon us — but Thank God for the heroic example of the students and working class in 1968 France that Stood Up For Their Human Rights and for the Dignity of Labor Rights to Just Compensation ! When will we, as a Nation, stand in solidarity against the Laws of the Ownership Society, the Koch Brothers, and Wall Street Robber Barons, et al. ! ! 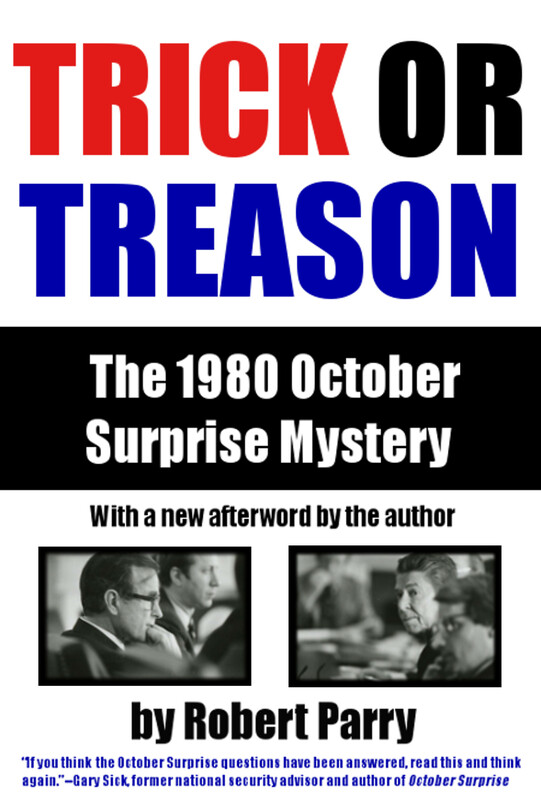 More historically pertinent, as regard to the turbulent 60’s in the USA, where/when All Hell Broke Loose with the brutal Assassinations of Leftist leaning Leaders JFK, MLK and RFK — as sequential marks of a suppression of “American Freedoms” in a Corporate Takeover of the US government.— These were US Government designed and carried out ASSASSINATIONS.!!! June 1st: It seems that every May, a number of scribes of similar persuasion feel compelled to take mouse in hand and deliver long-winded missives regarding the May ’68 “event” only to conclude, again and again, that nothing happened, it was just spoiled youth on a lark, that the revolution had failed. If that is the case, why do those scribes feel the need to remind the rest of us of this, year after year, for fifty years now? Perhaps because it isn’t true. One such scribe, neo-liberal conservative and self-styled “public intellectual,” Guy Sorman, took time from his busy thoughts to pen a memoir of his radical days at the Event (BTW: characterizing student protests and general strikes as an event certainly turns it into spectacle) published on May 16 in City Journal. For him, the cause of the hijinx was boredom in the bistros and the dictatorship of ennui. This supposes that Mr. Cohn-Bendit was bored when he provoked Francois Missoffe, Minister of Youth and Swimming Pools, at Nanterre by demanding access to the women’s dormitories. A student strike ensued and the Minister called the police. I think the Event began when the first CRS baton came down on a student’s head, or perhaps later, when the CRS – with batons – entered the Sorbonne, an unprecedented invasion of intellectual life. As for Mr. Cohn-Bendit, can we fault his entrepreneurial eclat; turning his radical chic into a hawkish-Greenie (who could have seen that coming) any more than Mr. Sorman’s transformation to “public intellectual?” A cow kicked over a lantern and the city of Chicago burned to the ground. And what of the cow? On Viet Nam as a point of origin, Mr. Sorman had this to say, “And as for Vietnam, we French had good feelings toward the country; we were not very well informed on the nature of the conflict, but if the French army had left in 1954, what in the world were American GIs doing there?” So that couldn’t be a source of ire among student youth. And on Algeria, not a word. No, apparently for Mr. Sorman this was merely a “lifestyle” revolution, resulting happily in male students no longer wearing neckties. DJ at least recognizes the significance and relation between Algerian and Vietnamese liberation movements. Yes, they were nationalist, but any post-colonial liberation movement is in essence, nationalist. Ironically, Ho Chi Min was a founder of the PCF and after a long, futile attempt to gain independence from France through politics, he eventually took up arms at home to achieve that goal. Algeria achieved independence in 62, and Algerians in France were ghetto-ized. Ex OAS crackpots were still lurking in the shrubbery and De Gaulle tried to stay out of the Cold War. The general strike by workers was achieved without the help or blessing of union leadership just as the students did not ask permission, and both groups, for a brief period, joined together in a common struggle – a struggle against institutions of authority; de Gaulle, CFP, union leadership, Ministers of Youth, chauvinism, police, military and the apparatus of colonial rule and its aftermath all on the vague but exhilarating premise of equality. But what do I know; I wasn’t there. Excellent detail, mike. Much gratitude for the Jacobin tip and the Kristen Ross book. I was a student ten years older than the others in 1968. I never saw their aspirations as noble or serious-just a feel good trip of anti-authoritarianism and self gratification. Still they were good folks and fun to be around. Certainly, today we live in a spectacle society and far greater concentration of financial and political power. I, for one, was Totally Ignorant vis-a-vis the Situationists, so I researched and been enlightened. Thank You, John! 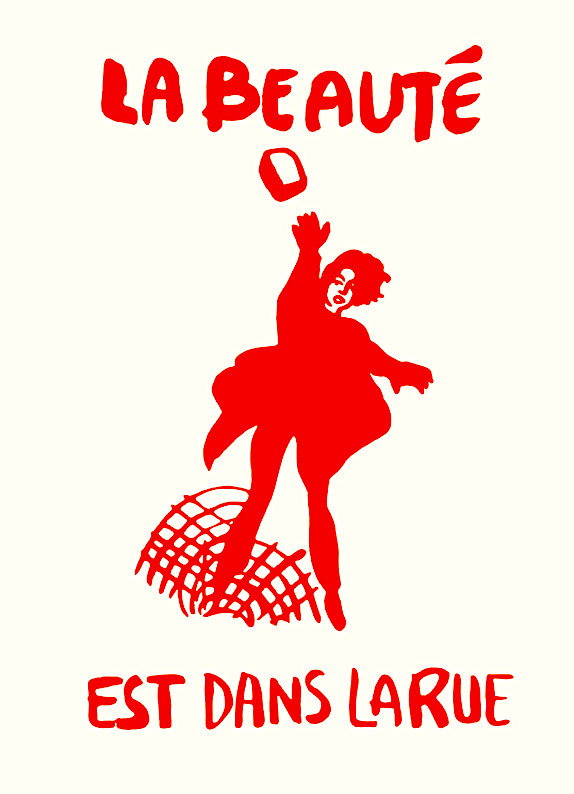 To any and all here likewise unfamiliar with the Situationists, the below links will help. I don’t recall careless rebelliousness among my teenage friends at the time. We wanted the truth, and were properly suspicious of established sources without good rationales for a war. We got no explanations, and later saw that this was an anti-colonial revolution. Gradually we saw that the US declared goals of “containment of communism” were fictitious or applied only to oligarchy, but that takes the insights of greater years and education. We were severely mistreated, and thereby saw the wickedness of the opportunist supporters of US oligarchy. I was also in Paris 1967 through 1968. I was part of a group of American resistors also trying to figure out where in the world was going. We are very active. Good friend got kicked out of the country. When I return to the US, I had to do jail time . I do think We had the best interest of humanity in mind. Gustavo Le Bon with his book, Psychology of crowds, proved again to be extremely obviously accurate. Another book which I believe spoke to the contradictions of the time and the motivations of the students and humanity, was Franz Fanon and his work describing the effect of INFORCED DICTATED REALITY . One last comment,: I believe the seeds of an Authortitarian Society, begin in early childhood. For most of us back then it was a party, a blast. It was like getting people to listen to people who didn’t know what they were talking about. Were we manipulated. Without doubt. By whom? Who the hell knows. Anastasia, your recollections are what I remembers about the young people at Michigan. Who the hell knows and who cares. They were fun to be around, at least those who didn’t take themselves too seriously. 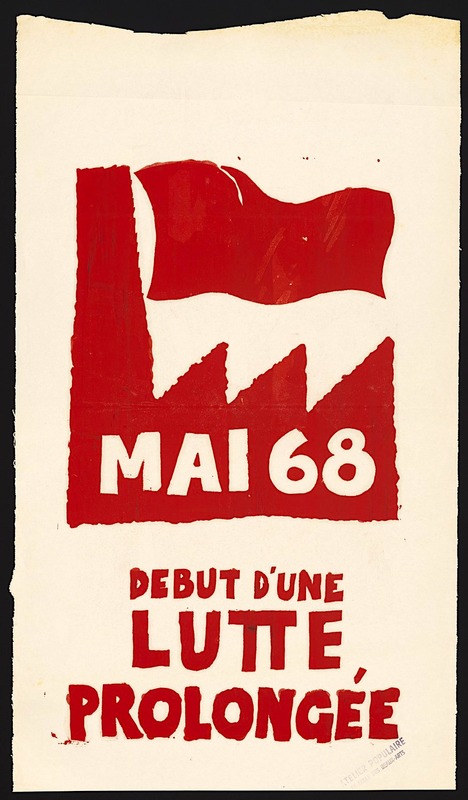 What May 68 did was to inspire imagination, that a better world is possible. Sure, it did not achieve its goals – but it TRIED, and its “goals” were the complete abolition of consumer capitalist society! These same people NEVER have a positive example of “this is what has been shown to work”, they can only nay-say those who seek to overthrow all that is wrong with society, with absolutely no institutional support for doing so, because they did not achieve their goals, that, in this case were ADMITTEDLY impossible ones (Be Realistic – Demand the Impossible). Remember, De Gaulle had to use the threat of the army in order to end the general strikes! 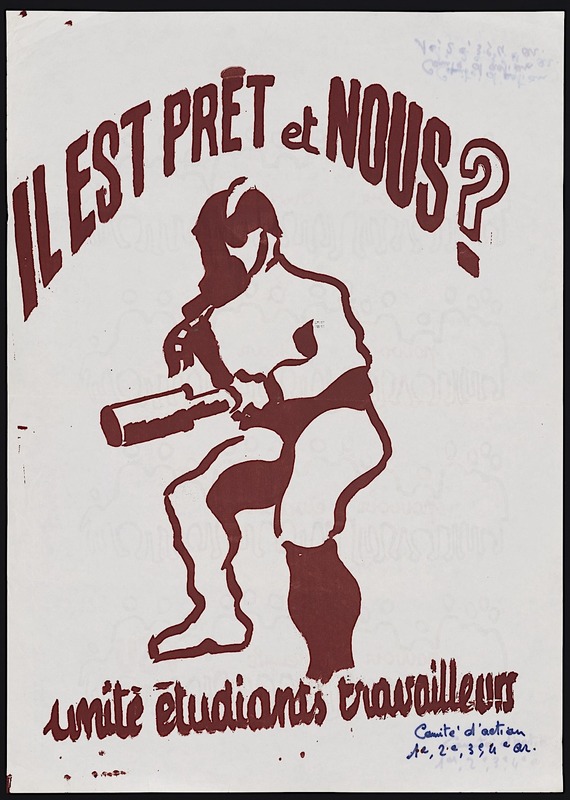 If one wants to see the legacy of the Situationists, their legacy is very much still around – The Yes Men, Adbusters, Reclaim the Streets, Occupy, Punk Rock, street theatre, etc are all parts of the legacy of the Situationists. Paris of May 68 still serves as an inspiration – IT AT LEAST TRIED. DJ whines here that it did not focus on Vietnam – yet, by that point, France had pulled out of Vietnam – there was not much that French people could have done to influence America at that point. Before anyone demeans the uprising in Paris of May 68, one needs to have an example of ANYTHING that came closer to winning in a developed country in the 20th century. Well said. DJ never offers up an alternative. I think we know why. The Tragic Sense of Life is a result of a species with so much wonderful promise being destroyed by it’s most evil members, and the good souls within this species of humans being inadequate to prevent this nightmare from happening. One night a friend and I took some LSD and went to a performance of Puccini’s opera Tosca. The message of how evil was destroying all that is beautiful and loving penetrated deep into my heart, leaving a sacred wound that has not healed since that evening. DJ is always so superb and enlightening beyond words. To fail to read Diana’s trenchant and incredibly insightful essays and columns is to court genuine ignorance. Off topic: Over at InformationClearingHouse the great Pepe Escobar has a spectacular piece on his very recent trip to Iran. Do not miss it. Yes Drew. Pepe draws a wonderfully intimate picture of life in Iran today. This existing euphoria was stylishly depicted in the excellent 2003 film, “The Dreamers”. Ayn Rand’s philosophy live and on rampant display! The film is a great achievement as the recording of actual events and affects that played out as a spontaneous mass insanity. The current Tory regime – known at Nowhere Towers as the Simulated Thatcher Government (STG) – is fixated with shrinking the state. They don’t even try to deny it. If Thatcher herself “believed” in Hayek’s Constitution of Liberty, then today’s Tory government is inspired by Ayn Rand’s terrible prose. By the way, it’s widely believed that Thatcher hadn’t actually read any Hayek and her knowledge of his ideas were mediated to her by the child abuser, Sir Keith Joseph and former communist, Sir Alfred Sherman. Four years ago, I spotted, what I’d considered to be, traces of Rand’s ‘philosophy’, “Objectivism”, contained in the 2010 Conservative election manifesto. Daniel Hannan and Douglas Carswell (now a UKIP MP) wrote a book called The Plan: Twelve Months To Renew Britain. According to the pair, their book was inspired by Objectivism. They gleefully told their readers that some of their ideas had been adopted by Cameron and co. The book itself offers unsourced graphs and a lot of badly thought out remedies for a series of problems that the authors claim are caused by the state. One stand out line from the book is “the state is running at capacity” (Carswell and Hannan, 2008: 18). Does the state have a capacity? Is there a stated “capacity” for the state or is that just an empty rhetorical device? It’s a curious line to be sure. The Plan is essentially a manifesto for a nightwatchman state. Think of a land with no infrastructure, rampant crime and endemic corruption and you’re halfway there. 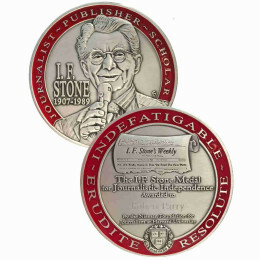 Rand’s influence can be heard in the language of government ministers: the insistence on “hard work” and the frequent mention of the somewhat vague concept of the “wealth creator” versus the scroungers and layabouts, resonates with the language in any one of Rand’s turgid novels, which cast the rich as downtrodden heroes and pits them against their nemesis: the moochers and looters – the latter being a shorthand for the enemies of unbridled cupidity. A couple of years ago, Bozza wrote an article for The Torygraph which claimed the rich were an “oppressed minority”. The right wing idea that government spending vis-a-vis We The People is “the problem, not the solution”, as Reagan Declared, is a fundamental/first principle of his political philosophy. His pursuit of “Shrinking the State” does not bode well for the US of A. Outside of the US, “Libertarianism” has NOTHING to do with Ayn Rand, or Murray Rothbard. Only in the US are people so stupid as to think a starving man who needs to sell his time in order to prevent starvation is “free”. Only one ignorant or intentionally dishonest would make a claim that the Situationists had anything in common with Ayn Rand or her ilk. John, thank you for your informative knowledge of the Situationists. My comment had solely to do with the chaotic atmosphere that permeated Paris in May, 1968. The reference to Ayn Rand had to do with her personal passion for hedonistic “free love” and absolutely nothing to do with politics. I repeat – – – “This existing euphoric inhibition was stylishly depicted in the excellent 2003 film, The Dreamers”. The film and the documentary (historical filmed footage) put on display the the rampant disregard for Order and Decorum that overwhelmed parts of France that month. For me the essay by William Pepper sums up the intense feelings at the time. William Pepper is incredibly significant, perhaps more so now, because he is still alive and a first person witness to “our times”. He’s almost like Forrest Gump, in that he was directly involved with the most significant events of our time either as a reporter or as a researcher of the truth. 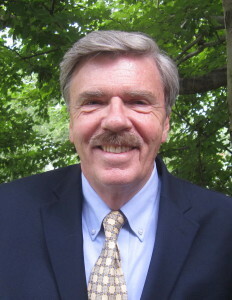 He has been investigating the Murders of the Sixties for a lifetime and he knows the answers. I must caution readers that the linked essay is heartbreaking. Thank you, Bob. Heartbreaking indeed, and profound. I went to a 30th celebration of May 68 by a socialist group in my city. Despite, an excellent speech by a visiting Italian activist, who bought up very similar reservations as the author here, the other speakers sprouted the usual clichés (as if they were having a May’ 68 theme party) and also many of the attendees seemed more concerned with the door raffle prize on the night. Yep, the consumer society had been destroyed. Not! 20 years on, the society of the spectacle seems even more pervasive and life threateningly cancerous. A great opinion piece, as one always gets from Diana Johnstone. “Probes at understanding”, not pompous and shallow exclamations like those of her self-serving critics. So the confused revolutions of the 60’s didn’t work. 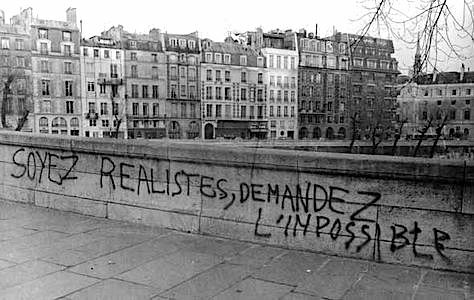 But does that mean that a real revolution is not possible? What about Cuba? Maybe the revolution we need is more inner, and less outer? How would you facilitate a deep change in the minds of a large number of people? That’s our problem. Without that kind of change, nothing good will endure. mike k, thank you, I have a significant link as a partial answer to your question that I will provide below. The great thing about this site is that many regulars have imagined legal and logical ways to correct the Treason that has been our reality for more than Fifty Years. The link shows more options. Thanks for the link, Bob. I have spent a lot of time absorbing the findings of climate scientists. The matter of acting to head off the disaster they are predicting is the nut of the problem. Those in the pockets of industry giants, like our senators are not going to do it. How to awaken the public is our key problem. The same propaganda that is impelling us to nuclear war is putting us to sleep about climate change. Behind it all is the oligarchs who must be displaced if any of this is to change. We have not come up with any way to do this in time to prevent the awful world that is bearing down on us with increasing speed. This inner problem of awakening minds is the key to our salvation from ourselves. We need to solve it pronto – or else! If you’ve been following the story of the official response to Occupy Wall Street, it was apparent that the 17 city paramilitary crackdown was coordinated; it came out later that the Department of Homeland Security was the nexus of that operation. The deep FBI involvement is a new and ugly addition to this picture. Several impressions emerge from reading the summaries and dipping into the FBI documents:…..
One architecturally sad legacy of 68 was the end of the Parisian hallmark cobbled streets, as shown in the photo of the guys crouching behind the Peugeot. As the cobblestones had been used as ammunition to throw at the police etc., TPB decided to remove them all. I always get nostalgic about them when I see old French films. Yes, and Haussmann widened the boulevards. Exactly how I feel after reading this. “Macron’s invocation of European culture serves to win support for his reactionary project among the educated middle class, which once styled itself as progressive but has now, in the face of growing international and social conflicts, discovered its love for the nation, military and a strong state. Nobody embodies this transformation better than Daniel Cohn-Bendit, who served at the Goethe University as Macron’s stooge. “In the 1970s, Cohn-Bendit and his close friend and protégé Joschka Fischer turned their backs on street battles and set out on ‘the long march through the institutions’ that would lead them into high positions within the state. Fischer became the first Green minister in a state government in 1985 and German foreign minister in 1998. In this role, he paved the way for the first foreign intervention by the German army since World War II and supported Chancellor Gerhard Schröder’s anti-working class Agenda 2010. “Cohn-Bendit, who is both a German and French citizen, made a career for himself in the Greens on both sides of the Rhine. He was a member of the European Parliament for twenty years, leading the Green group until 2014. In this role, he backed wars in the Middle East and North Africa, and authored a manifesto in defence of the European Union (EU) together with the former Liberal prime minister of Belgium, Guy Verhofstadt. Amazing article, thank you Diana Johnstone. To the question genuinely what was May 1968? It was genuinely part of its time, there was truly “Something In The Air”. I was a ten year old first world peasant, hearing ” I Am The Walrus” for the first time, and everything changed. Not that everything was great after that, nothing was, but there was a fissure flash of consciousness, whose value can be seen in the bad press it gets today. Did it occur to you that you are reading one more in a series from her with a purpose? Those kids, so impatient, they want everything their way right now, blah, blah. Were you ever a child and hear this from a parent? Did you think that when you were a parent you would remember and not be like that? Yeah, all of us said that. 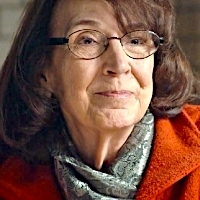 And few of us remember – including Diana Johnstone. I do. Those kids read the best of their parent’s generation, and the one before, and before, and learned. They learned from Breton, Luxemburg, Marcuse, and applied it well. Individual personalities, even if they were leaders, are too easy a target to use to discredit what they did. Like Cohn-Bendit. How many of any generation has done this? Revolutions save us from ourselves, reflective of a tension in an oppressive culture that finally bursts, and will always depend on the spirit of youth. I respect and encourage that. DJ is a tired old fart who I mistakenly gave a free pass when she slandered others recently. If this is her mission in life, to attack those who make revolutions, she deserves all she gets. May 68 almost succeeded. It respected anti-colonial and anti-imperialist resistance, in spite of what DJ implies. And it was beautiful. Oakland Pete – you’re about as predictable, tired and boring as trolls get it is sad to say. CN is a top flight site and certainly deserves better than what your trolling is providing. It speaks volumes that you can’t read a retrospective effort as an attempt to better understand the significance of May 68 without doing your usual troll dance suggesting that engaging in such thoughtful questioning implies Diana J’s “mission in life” is to “attack those who make revolutions.” What pure slapstick BS on your part, but an excellent example of using the (“4Ds: Deny / Disrupt / Degrade / Deceive”) – right out of the troll manual. I linked above to said troll manual (that was part of the Snowden documents) so you can give yourself a much needed refresher. Your shtick is old and stale. PS – I loved the “free pass” you “recently” gave DJ when she was so terribly inconsiderate as to call out your imperialist war monger buddies posing as “leftists.” “Free pass?” That’s priceless. Thank you, well and eloquent said. I wondered at times what the article would conclude, but did not see it as OP did. Such articles might ask the questions explicitly so that readers would see the purpose of the inquiry, which was not merely to spoil the spirit of ’68. It is difficult to express disappointment with “the illusion of an imminent revolution at home” without seeming to disparage the spirit of young activists, but CJ does not do that except for Cohn-Bendit. Perhaps the article could clarify that after 1975 there was no (similar) war for activists to fight, the young were building families and careers through the 1980s, when the US imperial wars were kept largely secret, with the collusion of the Reaganite mass media. So the assimilation of an activist generation was due not to their hypocrisy but to “new forms of oppression” developed by the “world of reaction”, which Castoriadis thought was enabled by any form of activism. NSA files from the Snowden archive published by Glenn Greenwald reveal details about GCHQ’s Joint Threat Research Intelligence Group (JTRIG) unit, which uses “dirty trick” tactics to covertly manipulate and control online communities. After his departure from GCHQ, Hannigan joined BlueVoyant, formerly BlueteamGlobal, a cybersecurity services firm. Its senior leadership team at BlueStreamGlobal. later BlueVoyant, includes Ron Feler, formerly Deputy Commander of the Israel Defense Forces’ Unit 8200, and Gad Goldstein, who served as a division head in the Israel Security Agency, Shin Bet, in the rank equivalent to Major General. The Boad of Directors includes BlueteamGlobal’s board of directors will includes Nadav Zafrir, former Commander of the IDF’s Unit 8200. In addition to their purported cybersecurity activities, private companies have enormous access and potential to promote deception operations. I’ve never really understood what kind of mindset someone would have to have to actually “play dumber” than they actually are “for a living” no less, all with a goal of disrupting free speech. Thanks for that breakdown of the GCHQ and related relationships. Very interesting connections. How many of any generation has done this?